Fab examines the process of recording an electric guitar amp. By focusing on things like placement and angles as well as listening to a few different microphones and analyzing the impact of these variables. This video will help you cut the grease out of the guitar recording process. He even pits an SM57 against an original AKG C12 to fascinating results. Good evening children! Today, in our continuing education for unemployed adult series, we're going to talk about how to mic an electric guitar amp. In this case, there will be no actual live guitar player to keep everything safe. What I did instead is extract a part from a record I just did. When I record a guitar for a production, I tend to record the amp, and a DI. The DI gives me a safety. That allows me to rerecord the guitar later, without the guitar player in the room, so I can choose my own amp. Now, in this case, the part you're gonna hear was recorded with this Les Paul, into this Little Labs Redeye, which is both a DI, and a reamp box. I used it as a DI, straigth into a 2108 from Universal Audio, into Pro Tools. And then, I'm taking the track from Pro Tools - line level, through my patchbay, through a cable, back into the Redeye in Reamp mode, coming out of the Reamp, into the amp. Because of this setup, I'm able to listen to only differences between microphones because the amp is the same, the guitar is the same, even the playing is the same, because it's the same part every time. I can really focus on what the microphone does to the sound. First up, a venerable Shure SM57. It's a hundred bucks, and it's used on more guitar amps than anything has been used on anything ever, in the history of mankind. What we're gonna do is use the 57 to explore the different possible positions for a microphone in front of the guitar amp. And then we'll try other mics. I put it there because I felt like it. No rhyme or reason, I've seen people put it there, let's listen to how it sounds. First, let's listen to the DI. It's right here, and it sounds a little bit like this. It sounds like a DI. I'm gonna send it to the Reamp box, which is channel 3 here, today. And I have this track here for the 57. I'm gonna put it on Record. 2108 feeds the converter, feeds this track. Here we go! Ok! So that's not bad, but that's not great, it's in between. It gives us an idea of what the amp sounds like, but it's not necessarily a very pleasing sound for a guitar, it lacks a little bottom, right? That's normal, because we're pretty far away, and it's a dynamic microphone, it is what it is. dead center in front of the amp. If I go to a club, that's usually what I see. I see the engineer putting the microphone straight on the amp, if it's not hanging from the cable from the top of the handle, but we don't do that here. So let's do that. Let's take the previous track off record, we have this new track here. I'm gonna solo it, so I only hear that, and listen to it. That's cool! A lot more bottom, and obviously a lot more presence. It's kind of fun to compare the two of them. Check it out. This is what we had before. Bringing the microphone closer brings a lot more bottom, which makes sense. It also brings a lot more clack. What other options do we have? A lot of people like to put the microphone on the edge of the cone. To do so, they have this little flashlight trick. Let's do that. We're gonna move the microphone from the center to the edge of the cone of the speaker of the amp. more or less here, and put it there. Now, if you don't have a flashlight, you can also feel for it. But it's fun to do the flashlight thing. solo it, listen to it. Isn't it amazing how much of a difference this much of a distance makes? It's pretty wild. This is what we just recorded. And this is the center position. Night and day, right? One is really bright and clanky, and has a kind of like a muddy bottom, and the other one has even more bottom, but is all muffled. Some people like to use angles, meaning, instead of facing the microphone straight at the amp like this, put it in an angle like this, so that in theory, it doesn't get as much transient energy coming from the cone. At least, that's a theory, so let's move the microphone and check it out. By the way, for those of you who are wondering, this is a Gibson G20T from the mid 50s, and it distorts when you look at it. Let's compare! Before, straight onto the amp. The angled one has a little more bottom, is a little thicker, and has less transients. It's a really subtle difference. Is it gonna make a huge difference in the session? No. But it's interesting to see what it does. I'll play it again, check it out. This is straight on the edge of the cone. And this is with the angle. The point here is that none of these two sounds are working for this particular mic, with this particular amp. It may work with a bigger amp, it may work with a different mic, a different guitar, a different player, or on a different day, with the exact same setup, there's no science to this. The idea is that you're gonna pay attention to what's going on, listen, and form your taste on what is a good sound. My taste tells me this is not a good sound. the microphone in the middle gave me all that presence and that clack, but the bottom was not good. This gives me a muffled sound, but a really interesting bottom, so what if I did something in the middle? I'm gonna take the microphone, and put it at an angle in between the center and the edge of the cone. Here we go! Ok, that's pretty rockin', let's compare. In between the edge and the center, angle. We're starting to get a hybrid of the two positions. As a reminder, we started all the way here. And then here's the center take. And this is the in between with the angle, the last one we just did. This position is a clear winner over the other ones. Now... since I'm a curious human being, and I don't like to not know, what would it sound like if we left the microphone there, but put it straight on the cone, with no angle? Let's try that. The good thing at Puremix is that we are not detail-oriented at all. We have nothing better to do. Let's move the microphone one inch, and see how it feels. It's amazing the difference an inch can make actually. Let's check it out! This is the one with the angle and the same position. And this is without the angle. More transients, more presence, a little more high end. It's not night and day, but it's the difference between having to EQ, and not having to EQ. And grown men try to not EQ. Let's compare the difference between no angle, slightly on the side, and no angle, straight in the middle, I think that's very educational. What we just did, which is in between center and edge, no angle. And this is center, dead center. Listen to the bottom of the riff, to the... (riff singing) Listen to that part. That's what gets most affected. First, in between the two positions. Same angle, same microphone, same player, same riff, same amp, same preamp. It's crazy. So what's to take away from this? That's pretty simple. If you're far away from the amp, you get no bottom. The closer you get to the amp, you get more bottom. If you're straight in the middle, you get that weird bottom, a little bit of a heavy transient happening. The more you move away from the center, the darker it gets, the more bass-heavy it's gonna get, and the more uneven it's gonna get. Which could work, if you have a super bright amp, for example. And then, as you get closer to the center, you get a hybrid of the two. Using angles is a good trick if you find a spot you like on the cone, but you wanna be able to fine-tune the tone a little bit. Use more angle to get less transients, a little more bottom. Now, that's all one microphone. Can we get a better sound with a better microphone? Let's try it! What defines a better microphone? Let's do it like they do it in the catalogs. The most expensive one is the better one. So what's the most expensive microphone one can get these days? A 47, or a C12. I happen to have both, let's try the C12, because it's heavy, and it's fun, and it looks good. I'm gonna put the C12 in the exact same position I just put my 57, and compare. This C12 is a very heavy microphone, which is put on a very heavy stand. The reason why we put the heavy microphone on a heavy stand is so that it doesn't drop, because otherwise, everybody cries. I called the track C12 Same Spot. Interesting, isn't it? As a reminder, this is what the 57, in the same spot, sounded like. That's a lot of bottom! It's a lot of boominess, it's a lot of... almost plosives, like if somebody would have said a P, or a T in the microphone, because it's so close, and it's freaking out. In this particular case, actually the C12 is not cutting it. There's something I'd like to show you, which is kind of fun. Check it out. I'm gonna high-pass the bottom to get rid of all that..., all that stuff that's freaking out the capsule there. And then, I'm gonna make it a little brighter, just for kicks, maybe a shelf at 2k, or something like that. And this is what it would sound like. This is the C12. And this is the 57 in the same spot. Again, C12 with a little EQ. As a reminder, there's a $14,900 difference in prices between these two microphones. Is it worth it? I'll let you decide. I think that we should try two more microphones that no guitar amp miking video would be complete without. A Sennheiser 421 dynamic microphone, a classic, and the Royer 122 ribbon microphone. You can use a 121, I have a 122, you now have to listen to the 122. I'm gonna put the 122 a little further away from the amp, because from experience, I know that if I put it right up the amp, it's gonna sound bad, a little too thick, a little too dark. I know it's not an exact, exact A/B, but that's not what we're doing, we're just trying to figure out what sounds good. I'm going to put both tracks on Record, I'll start with the 421, and then, I'll switch to the 122. Here we go! Let's compare the 421 to the 57, they're both dynamics, they should sound similar, right? 57. The 57 is punkier, more aggressive, less polite, the 421 is actually a better rendition of what was in the room, it doesn't have as much color. It's more even. Your choice is gonna depend on what kind of record you're gonna do, what mood you're in, and as always, what you had for breakfast that morning. Let's listen to the 122. Now, that's fun too! That's a lot more vintagy, and a lot more crusty. As a reminder, this is what the 57 sounded like that far away. 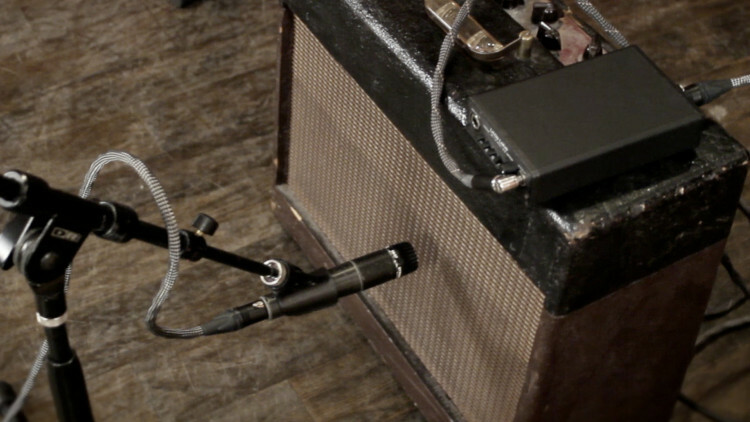 Obviously, the 122 is a better microphone for distance miking on guitar amps. It's a figure-eight, but I don't hear that much room. The other one is a cardio. I actually hear more distance than I do on the 122. The point here is not to do a microphone shootout to find out which one is the best on a guitar amp. That does not exist, as far as I'm concerned. What exists is this: I have this mic, I have this amp, I have this guitar player with this guitar, I have this mood. If I put the microphone there, this happens. With this parameter, now I know that if I go further to the edge, it gets darker and fatter. If I go this way, it gets thinner and further away. If I go in the middle, it gets clanky. If I use an angle, I get a little less transients, a little more bottom. The combination of these factors should help you get a better guitar sound, out of any guitar player, any guitar, any amp, any microphone, any breakfast. As a conclusion, let's listen again to a sample of what we recorded today. 57, middle position, no angle. The price is right! C12, with the EQ. Shure SM57, Sennheiser 412, AKG C12, Royer-122, Little Labs Redeye, Vovox cables and a really nice Gibson G20T. Fab, My home guitar recording setup consists of http://www.sweetwater.com/store/detail/SilentSisTan/ and http://www.sweetwater.com/store/detail/SilentSister/ hooked up to http://www.sweetwater.com/store/detail/RockCrusher/. Amp speaker outs connect to the RockCrusher, of course. Do you have any tips on getting great recorded guitar sounds from that setup? Thanks! This video is well done but only covers the very basics of single mic recording for anyone wondering. I'm hoping that in a future video more advance techniques could be covered like double micing at diferent distances and how to listen and avoid phase issues that arise from dual micing the same source. Even covering different cabs like dual or triple micing a single speaker, 2x12, & 4x12 cabs. That to me sounds like a natural sequel to this video. Hopefully it's being considered. Great, but you should better explain the routing between the DI, DAW and amplifier! Beautiful examples of the various microphones. Thanks. Dear Fab! Amazing Videos, I Love them all! I record lots of guitar and I love the idea of using a DI Routing that you showed us. One question: I use Logic Pro as my main DAW, I own a Presonus 16.0.2 Mixer with 12 Xmax Preams, and other basic goodies. however I cannot route the signal back from my mixer to another DI, & to the amp. My daw/mixer's firewire input/outputs are just not able to route to an aux output at all... And suggested Gear I can invest in to do the trick? @Fab: great news! Looking forward to the wav-files. Thanks! @dagovitsj: WAV files coming when Sandy gives us our power back. @strangedays: we are thinking of making a 'get a good guitar sound' video for different styles. And inviting specialists for every style. It'll be a sec but ti'll be very instructive. Crazy how one inch makes a difference, "That's what she said, lol" Great video as always. Bless and hope everyone is good over there at flux after SANDY. Ok Fab: go on this way ! Another great lesson. But ... instead of recording my guitar with a C12 I'll prefer to have a good breakfast for years ! Great video. I appreciate the Mic postioning just wondering on whether you can expand on this by going into gain adjustment, amp eq, and different heads. I always find getting high gain sounds tricky as they can be harsh. 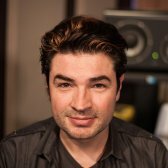 Also layering using less gain? Thanks again for the great vid, worth every penny. ps Does Fab/Flux reamp many different instruments or primarily guitar/bass/keys tracks? Hi! A really useful video. It shows how important it is to listen and finetune you mic positions.